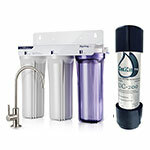 Modern residential water filters use a combination of different filter materials to filter out the widest range of contaminants from drinking water. 1). Rare Maintenance – With an under counter filter system, once you install it, you don’t have to worry about it for months. You won’t be constantly refilling a reservoir, that you would do with gravity-fed, counter top versions. 2). Uncluttered Countertop – Under counter filters won’t take up valuable counter space, leaving more space for preparing meals and other things. 3). Better Aesthetics – A Less cluttered countertop is far more pleasing to the eye. 4). Faster Filtration – Under counter filters use water pressure from your house to drive the filtration process. You won’t be waiting for hours for a very slow gravity-fed filter to finish. 4). Better Filtration – Under counter filters are inherently superior to pitcher and other gravity-fed filters due to the larger volume of filter material they use. Water is in contact with a much greater surface area of the filter material. This allows for a much more thorough job of purifying the water. 5). Easy setup – Sure, setting up an under counter filter is a little more involved than a simple countertop model, but not much more. Once installed, you’ll have months of purified, maintenance-free water, as easy as opening the tap. 1). Municipal Water source – Non RO filters are intended for source water that is pre-treated by a municipal water treatment plant. 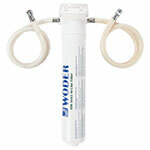 Most Non-RO filters are not capable of removing bacterial, or viral contaminants. Microbial contaminants are more likely in water from a private well. Water treatment plants are usually very good at destroying microbial contaminants. Under counter filters are effective at removing antimicrobial chemicals that have been used by municipalities, but left in the water. 2). Maximize Filtering Ability –If you’re water come from a well, or if you want a water filter that’ll give you the purist drinking water possible, then you may want to consider a Reverse Osmosis system. Visit our Reverse Osmosis page. If you’re looking to just remove or reduce the chemicals that your treatment plant cannot remove, here we review some of the Best Under Counter Water Filters (Non-RO). They don’t have storage tanks, so they’re simpler and less expensive than an RO systems. Some of these filters are rated up to 5 years before they need replacing! Model #: UC-200, Amazon’s Choice for best value, 4.7 out of 5 stars with over 1,600 reviews. CuZn Water Filtration Systems, Inc., pronounced “cousin”, was founded by owner Jeremy Hess, who has over 3 decades of experience in the water treatment industry. CuZn were awarded several patents for commercial and residential water and air treatment systems. Their residential water filters plant is in Fayetteville, Arkansas. 1st Stage: Micro Sediment Membranes which reside between each media layer, filters out undissolved particulates, sand and other particles. 2nd Stage: Coconut Shell Activated Carbon removes unpleasant chemical tastes like chlorine THM’s, herbicides and pesticides, odors and cloudiness. It filters particles down to 5 microns in size. 3rd Stage: A powerful KDF-55 filtration media made up of 55% Zinc and 45% copper that’s meant to maximize filter efficiency in the reduction or removal of chlorine and prevent bacteria growth within the filter. It also helps to remove inorganic contaminants like lead and other heavy-metals. The UC-200 does not remove total dissolved solids (TDS’s), so it purifies water without removing calcium & magnesium minerals. The KDF-55 and activated carbon filtration media have been tested to NSF/ANSI standards 42 and 61. NSF/ANSI standards ensures that your product meets the regulatory requirements for the U.S. and Canada. It often meets and fulfills the testing requirements for many other countries as well. NSF/ANSI 42 standard establishes minimum requirements for systems designed to reduce non-health related contaminants. In other words, it assures that the water is aesthetically pleasing, in that it’s free of visible particles. NSF/ANSI 61 testing covers all products pertaining to drinking water. It determines what contaminants may migrate or leach from your product into drinking water. It also confirms if they are below the maximum levels allowed to be considered safe. The UC-200 is 15.5″ (39.4 cm) tall x 4.0″ (10.2 cm) in diameter and is made in the USA. The UC-200 is Fitted with 3/8″ Male Compression Inlet/Outlet Fittings & comes with a 36″ Long 3/8″ x 3/8″ Braided Stainless Steel Compression Hose. CuZn’s UC-200 has been well tested to comply with standards that assure contaminants are reduced to safe levels or are eliminated outright. It’s a very simple and easily installed filter that provides great-tasting water. This filter has an incredible capacity of 50,000 gallons (189,000 l) or 5-years, whichever comes first. Unless you have an inline flow gauge, you’ll just have to estimate your volume usage. It crries a 90-day satisfaction guarantee. Very high capacity and long life. Depending how you look at it, CuZn says there is no Third Faucet hassle, but this means that every drop of water that comes out of your kitchen faucet will be filtered, whether it needs to be or not, shortening the lifespan of the filter. Then again, a 50,000 gallon capacity over five years equal about 192 gallons per week. I guess it’s highly unlikely that you and your family will ever consume that much water every week. Does not remove beneficial electrolytes calcium and magnesium from the water. There is no waste water as there is with an reverse osmosis system. Will not remove microbes, however, if your water comes from a municipality, pathogenic contaminants should not be an issue anyway. Will not remove monochloramines. 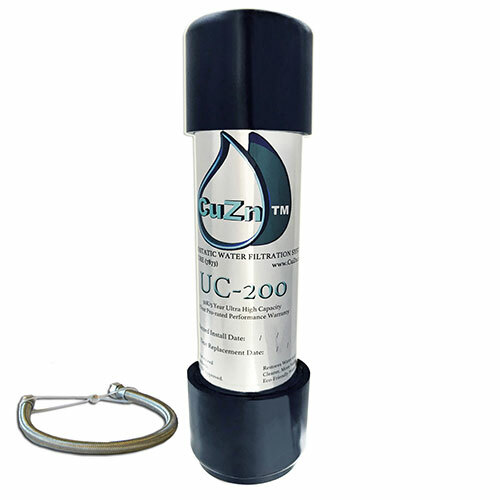 however, if your municipality uses chloramines as a disinfectant to kill pathogens, CuZn UC-200-85 is the filter that is rated to remove this chemical from water. Will not remove Total Dissolved Solids (TDS’s), however, if it did, it would remove all minerals which measure as TDS’s. This filter is extremely highly rated by verified customers with a 93%, 5-star, approval rating. People are very happy with this filter. Make sure to find out that your water treatment plant uses only chlorine to kill pathogens in the water, not chloramines. Between 15-20% of municipalities use chloramines to kill pathogens. I would feel confident with this filter. Woder “Direct-Connect filters are not meant to be replaceable. When it’s time to change, filter and hoses are changed as a unit. Model #: 10K-Gen3, 4.6 out of 5 stars with over 1,030 Amazon reviews. All Woder (pronounced “water”) Filters are manufactured in the USA and distributed by Nehara LLC., Newark, Delaware. 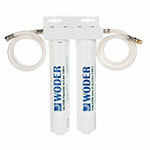 Woder filters are tested by independent laboratories to ANSI standards. The filtering media Woder uses in their filters is a combination of granulated carbon and silver blend. These filters are capable of eliminating 99.99% of lead, heavy metals and chlorine. They also remove chromium 6, mercury, volatile organic compounds, carcinogens, and other contaminants. They filter out turbidity, odors and bad tastes. This special blend of media gives it a Selective Filtration™ ability that attracts harmful impurities, but has no affinity for healthy minerals. This allows minerals to remain. Note: For the longest filter life, use with municipal treated cold water only, not well water. Do not use with salty or softened water. Connects for use only with cold water for drinking. 10,000 gallons (38,000 l) of Water or 3-years, which ever comes first. The Woder 10K Gen-3 comes as a complete assembled kit. It has a ‘Smart Head’ with a built-in valve so you can change out the filter without having to turn off the water. It seems to be a very capable system that provides great tasting, highly purified water. The filter has a very high, 3-year capacity and uses the latest filtration technology. It’s very easy to install and greatly reduces chemical contaminants that water treatment facilities do not remove. I do wish that I could’ve found more information on the specific certifications that this filter was tested against. I found it particularly interesting that one customer had adapted this filter directly to their refrigerator. This filter will do a much better job, for much longer than a refrigerator filter. Rugged threaded, no-leak connectors with braided hoses. Highly popular and good feedback from majority of happy customers. Very High-capacity, high-flow and long filter life. Components are made from food-grade materials. They are BPA, PVC, and formaldehyde-free. Good price for a filter that’ll remove 99.99% of contaminants. Replacement filter is very reasonably priced for such a long-lasting, highly effective filter. No plumbing is required. Install in 5 to 10-minutes with an adjustable wrench. Vague description of certifications met. The Woder 10K-Gen 3 filter is a highly effective and well-liked water filter that’ll do very well purifiying your municipal water supply. This model allows for the replacement of the filter, which is reasonably priced. See more spec’s and the latest price on Amazon, visit Woder 10K-Gen3. Model #: 10K-FRM-DC, 4.4 out of 5 stars with over 90 Amazon reviews. 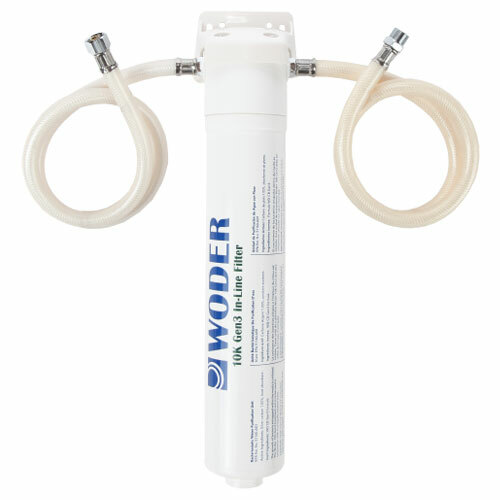 Woder designed this filter system for those who are concerned about fluoride in their drinking water. Many water treatment facilities in the U.S. still add this harmful toxin to the water supply. Intended for Residential and Commercial Kitchens and bathrooms. This filter combo does everything the Woder 10K Gen3 does (#2 above), but also removes up to 95% of Fluoride. 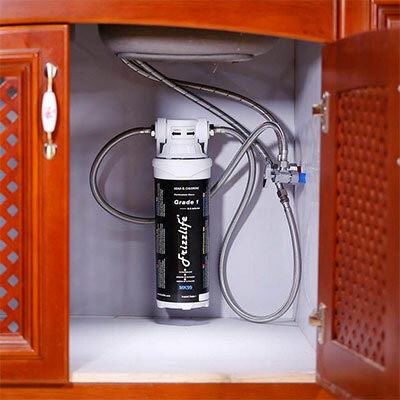 It removes up to 99.9% of lead and chlorine, greatly reduces heavy metals, chromium 6, mercury, volatile organic compounds, carcinogens, and other contaminants, as well as turbidity, odors and bad tastes. Note: For the longest filter life, use only with municipally treated water only, not for well water. Do not use with salty or softened water. Connect with your cold water supply only. 5,000 gallons (19,000 l) of Water or 2-years, which ever comes first. 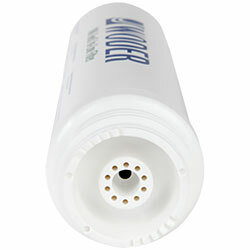 If you’re worried about fluoride in your water, this filter system is effective at removing a high percentage of it. In additional to that, you’ll also benefit from Woder “Selective Filtration” removing 99.99% of harmful contaminants, but keeping essential minerals. This 2-stage model is rated for a long 2-year lifetime and uses the latest filtration technology. It’s easy to install and greatly reduces chemical contaminants that water treatment facilities do not remove. Although Woder claims these filters have been certified to meet ANSI Standards, they do not publish the specific standards. I’ll continue to try to find more information about these certifications. Very-high-removal rate of fluoride and other contaminants. No plumbing is required. Installs in 5 to 10-minutes. Higher priced than other filters, but it also filters fluoride and you only change it once every two-years. 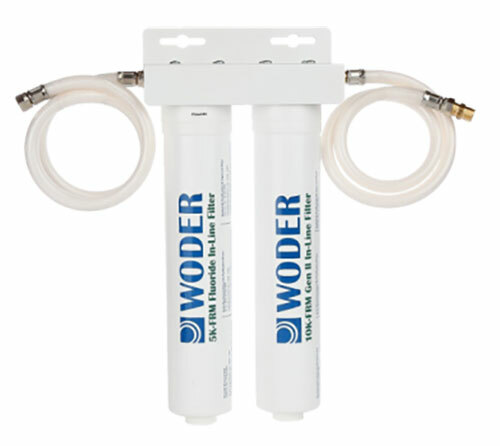 The Woder 10K-FRM-DC Fluoride filter is highly effective at removing a wide range of contaminants, including the hard to remove fluoride. It has no problem purifying municipal water. See more spec’s and the latest price on Amazon, visit Woder 10K-FRM-DC Fluoride. Model #: CS-2500, 4.1 out of 5 stars with over 30 reviews. APEC, Advanced Purification Engineering Corp. is the leading manufacturer of residential Reverse-Osmosis drinking water filter systems in the United States. They are based in the City of Industry, California and have manufacturing facilities there. APEC has been developing customized water treatment systems for over 20 years and is one of the last manufacturers whose membranes and primary filters are all manufactured in the United States. Treated with a bacteriostatic for the control of heterotropic bacteria. 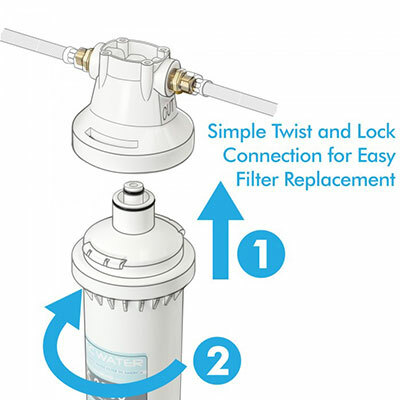 Quick-Twist connection makes filter replacement easy. (2) 30″ x 3/8” dia. braided hoses with 3/8″ threaded fittings for easy installation and no leaks. 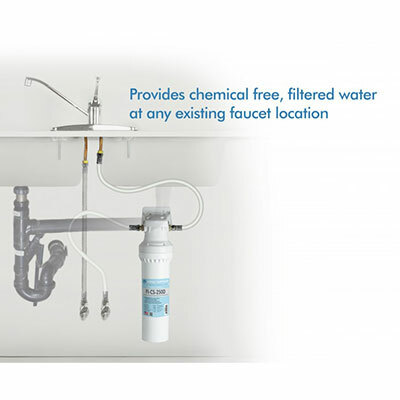 Provides filtered water directly to kitchen faucet. 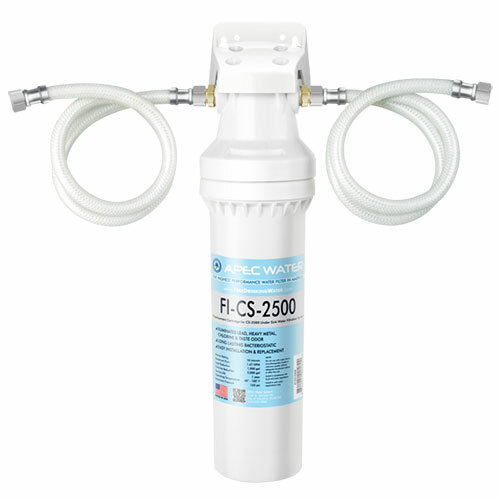 The APEC CS-2500 Filter is another easy-to-install and highly effective filter for purifying municipal water. The materials and filter media used in its construction are top-rate. This would be a reliable filter system for your home with a once-a-year filter change. Premium quality filter can last up to 12-months and operate reliably. Improved Booster pump design greatly increases pump efficiency and durability. Removes a high percentage of contaminants while retaining beneficial minerals. 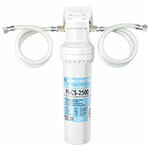 Quick change APEC FI-CS-2500 Replacement Filter is easy to replace and is reasonably priced. APEC’s Reverse Osmosis systems and filters are fully certified to NFS/ANSI and WQA standards, but I haven’t seen specific certification spec’s for this particular filter. Model #: MK99, 4.5 out of 5 stars with over 45 Amazon reviews. Frizzlife, Inc., DENVER, Colorado, is the U.S. distribution center for their filter products. They source their products from the manufacturing facility in Zhejiang Province, China. 1st Stage: PP (pleated polypropylene) sediment filter cartridge with 5 micron precision, reduces particle material such as sand, silt and rust from the water. A PP pleated cartridge filter is constructed by 100% polypropylene media. It will not degrade when exposed to a wide range of chemicals. A PP filter is assembled with multiple membrane layers, thermally bonded together to provide consistent pore sizes and better the dirt-rejection capacity. 2nd Stage: Block carbon filter cartridge with 0.5 micron precision that reduces 99.99% of LEAD, CHLORINE, ODOR and PARTICLES from the water. The MK99 does not remove total dissolved solids (TDS’s), so it purifies water without removing calcium, potassium, magnesium and other minerals. Service life: Filtration capacity for Chlorine is 5,000 gallons (18,900 l). Filtration life for Lead is 1,000 gallons (3,785 l). Generally rated at 6 to 8-months. The MK99 filter system uses the same replacement filter that the MP99 filter system uses. I think this filter is no less capable than any other similar filter on the market. In fact, the carbon block filter is rated to filter out particles down to 1/2 micron, far better than the others. It is imported, but from what I’ve researched, it appears to be well-made. This unit is well-liked and well-rated by verified customers who have actually used it. The filter is rated not as long-lived as other filters, but it’s supposed to be just as effective. Also, the replacement filter is not nearly as expensive as the longer-lived filters on other models. Instead of using the recommended replacement intervals of 6 to 8-months, I think I would adopt a 4 to 6-month filter change schedule. The second stage carbon block media filters down to 0.5 microns, which is far smaller than other similar under counter filters. Removes contaminants to a very high degree without removing minerals. The company informed me that by popular request, they are sending the entire MK99 unit for re-certification within the next 12 months. Hopefully this will include NFS/ANSI 61 certification. Shorter filter life, but much cheaper to replace. Has not been tested against the more meaningful NFS/ANSI 61 Standard, which determines what contaminants may leach from the filter into the drinking water. The NFS/ANSI 61 Standard also confirms that any contaminants that do leach back into the water from the filter, that they are below the maximum levels allowed to be considered safe. Not rated to remove fluoride. Based on my research and the majority of positive reviews, I would feel confident that this filter would purify my drinking water to my high standards. 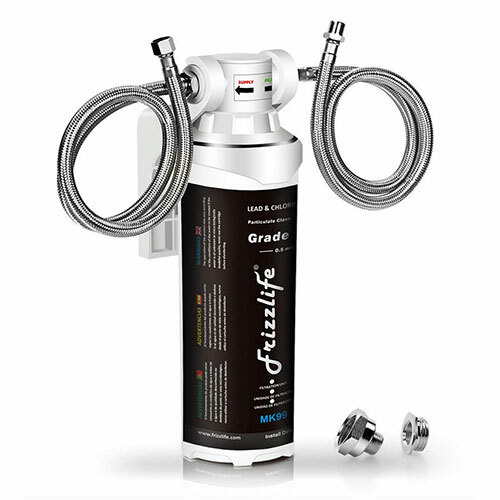 The Frizzlife MK99 and it’s filter are both very highly-rated by verified-customers and they are both priced especially well. If you’d like to see more spec’s, or the latest price on Amazon, visit Frizzlife MK-99. Why Do Under Counter Water Filters Work So Well? 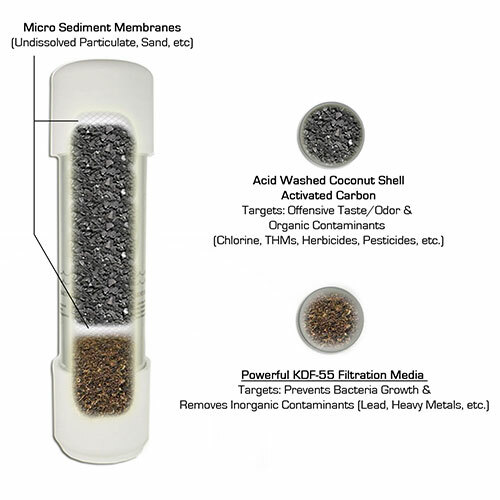 Granular Activated Carbon (GAC) and ACTIVATED Carbon Block are extremely adsorbent materials used to remove a wide range of chemical contaminants from water. Many scientists consider activated-carbon as an unusually effective filter media because of its unique ability to remove dangerous chemical compounds. Most chemicals have an affinity for carbon molecules, which locks up chemical molecules as they pass through the filter. Activated carbon, with its large surface area, acts like a sponge to absorb contaminants from water. The EPA prefers activated-carbon treatment over other media to remove a host of potentially hazardous and carcinogenic chemicals from drinking water. You’ll find installing such a system will be very easy, usually taking less than a half-hour. You can have delicious filtered drinking water only minutes after starting installation. These filters are driven by your house water pressure. Municipal water pressures are usually very good. Unlike gravity-fed, countertop filters, these pressurized filters will give you a continuously strong stream of filtered water. You’ll never have to deal with constantly refilling empty reservoirs, or dealing with clogged filters, which seem to be the norm with gravity-fed filters. Some of these under counter models include their own tap, from which to draw filtered water, while other models do not. That’s your preference. Some people don’t want the hassle of installing a dedicated tap. Think about this, if you don’t have a dedicated tap, you will be filtering every drop of cold water that flows from your kitchen sink. This may be what you want, if so, great. The benefit to installing a dedicated tap for your filtered water, is that your filter will only be filtering the water you use for drinking and cooking, not the water you use for doing the dishes or mopping the floor or for other things. Your filter will have a longer lifespan with its own tap. If the filter model you want does not include a tap, taps can be purchased separately and are easy to integrate. You start by adding a T-Valve to the cold-water line under your sink to split the flow. One stream continues to feed your kitchen faucet, while the other stream supplies your drinking water filter. The filter out-port feeds your tap. today, all refrigerators with water dispensers and automatic ice makers will have a built-in way for you to filter that water. This filter will need to be replaced periodically. If you have an under counter filter system, instead of periodically replacing the fridge filters, you may opt to feed your fridge with filtered water from you under counter filter instead. This would save you from also having to buy and replace your fridge’s filter too. All you would need to do is to add another T-Valve on the water filter outlet port. One stream of filtered water feeds your countertop tap, while the second stream feeds your fridge. Easy.